When 16-year-old Kerry helps a young man escape from a group of men who claim he is a vampire, she finds herself faced with some bizarre and dangerous choices. Companions of the Night has a Facebook fan page! Bulletin of the Center for Children's Books "Blue Ribbon Book"
This book started because I love vampire stories. But the rules for vampires change from story to story. For example, in some books, vampires burn up and die at the first hint of sunlight, but in other stories they're OK for short periods if they cover up and wear sunglasses, and sometimes they're fine in sunlight except that they don't have any of their special powers during the day, and I read one story where vampires themselves started the rumor that they couldn't stand the sun so that they could always prove they weren't vampires by being able to survive sunlight. I started thinking out for myself which rules made the most sense, and that's how the story started. I didn't grow up in Brockport, but I went to college there. (And, frankly, I had my doubts about some of those teachers...) Some of the places in the book are real (like the Lift Bridge Book Store and the Strand Theater and the fact that some of the houses are Victorian style); but other things are made up--there is no Quick-Clean Laundry (and there never could be in the place I describe it, because I say it's between the Strand Theater and the corner, but the Strand Theater is on the corner), and there are no such streets as the names I use for where Kerry lives and where Professor Marsala lives--I didn't want anybody knocking on a real person's door, looking for my characters. The laundry owner grabbed hold of Kerry's shoulders and shook her. "You don't understand," he said to her. "He isn't human. He isn't alive." Kerry was still looking at Sidowski, but the owner said, "Him," nodding toward the boy. "He's a vampire," the owner answered. "One of the living dead. He kills people to feed on their blood." Their prisoner shook his head, wearing an expression of horror on his fact that probably mirrored her own. Roth took him roughly by the jaw, forcing back his lips to reveal canine teeth that were slightly longer and sharper than normal but certainly nothing to get alarmed about. A vampire, Kerry thought. They think he's a vampire, and they're hoping very hard that I'm not one, too. It wasn't enough to step into the middle of what looked to be a ritual execution between rival gangs or druggies or international terrorists. She had to fall into a nest of grade-A crazies. Cynthia has a great website at http://www.cynthialeitichsmith.com/ where she has wonderful information for writers and book lovers. Cynthia's newest book is a gothic fantasy called Blessed. 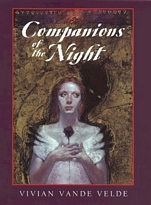 Companions of the Night is one of the books I most often get asked about a sequel to. Companions of the Night charm bracelet made by my very clever daughter. Visit her Sparkly Something website.